A pastel is a kind of medium where you do not need any paintbrushes, solvents or palette. You need not to be very good at painting with brush as all you need is some pastel sticks, paper and your fingers! There are many types of pastels available in the market in various forms and shapes. Primarily there are two types chalk pastels and oil pastels based on type and amount of binding agent mixed with color pigments. 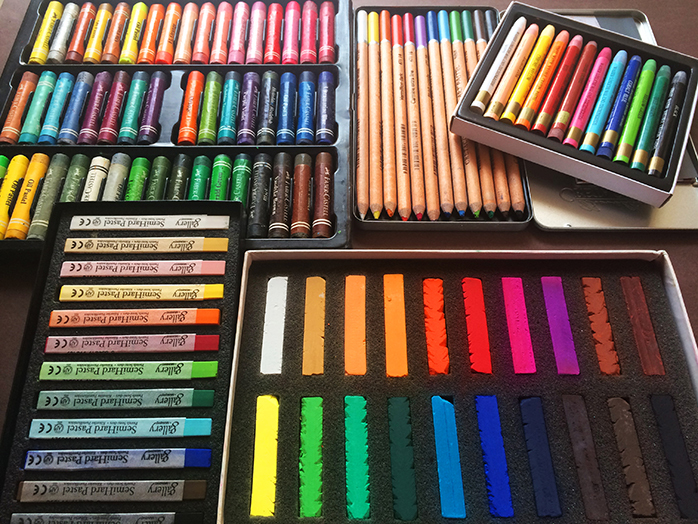 Soft pastels, hard pastels and pastel pencils are made from color pigments and binding agents that are mainly available in dry stick or powdered forms. Because of its dry nature and easy to blend technique, dry pastels can easily be combined with each other as well as other mediums like gauche, watercolor. Oil pastels are oil or wax based and water repellent hence cant combined with other pastel mediums. Pastels are available in two grades, ‘Artists’ quality and ‘Students’ quality. Artists’ grade pastels are more intense and fragile as it has less binder and more color pigment hence costlier too. Where as students’ grade pastels are comparatively cheaper in price but less intense and less brittle. Compared to paints pastel colors don’t get mixed very easily while gradation and get soiled easily. To avoid that, one can use wide range of colors, which is available in market. They are available in set of mix colors as well as palette range of single color. To start with one can use students’ grade pastels that are easily available in near by stationery shops.